This post is dedicated to all the cliché sensitive eye rollers, especially one of my friends M, who recently introduced me to one of the most versatile, innocent sexual ambiguity highlighting jokes in English language, “That’s what she said”. English is not my first language, and even after 20 years of life and work in the states, I still find myself baffled by little miscommunications, grammatical errors and mess-ups, my own, and of others. But, It all makes me fall passionately in love with every single one of them, as I am a sucker for pop cultured, cheesy, folklorish, idiomatic silliness, regardless of how cliché it may sound to a native American speaker. 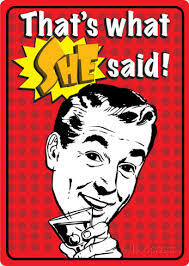 As simple as “That’s what she said” might seem, it possibly represents a more sophisticated joke concept for someone who is struggling with daily use of the language. So when they actually manage to grasp a simple cliché, and use it properly in a conversation, or even call on a good pun, I know that it causes sweet heart bubbles, it bears a sense of instant connectedness and recognition, and even awakens feelings of patriotic pride.